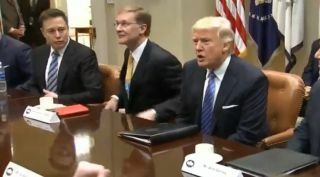 SpaceX founder and CEO Elon Musk, left, at a Jan. 23, 2017 meeting with President Donald Trump. Musk said on June 1 that he will depart the three White House advisory councils on which he serves because President Trump is pulling the United States out of the Paris climate accord. Elon Musk says he's done advising President Trump.